Thanh Hoa (VNA) – The central province of Thanh Hoa held a meeting on August 24 to mark 50 years since it inked a friendship cooperation agreement with Laos’ Houaphan province. 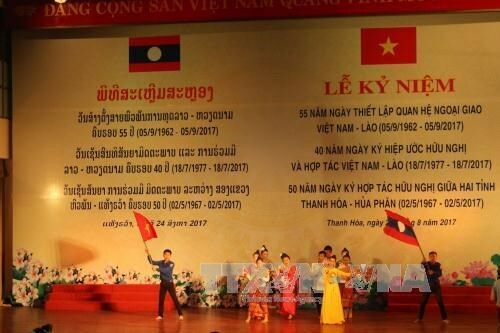 The event also celebrated the 55th anniversary of Vietnam-Laos diplomatic ties and 40 years since the two countries signed their Treaty of Amity and Cooperation, and is part of the Thanh Hoa-Houaphan Friendship Culture Week, held in the central province from August 21-25. Chairman of the local People’s Committee Nguyen Dinh Xung said that over the past five decades, the relationship between the two provinces has grown remarkably. Cooperation activities in culture, education and health and delegation exchanges have been held regularly. Thanh Hoa has to date helped train 538 Lao students at its universities. The two sides have also coordinated in joint patrols and border marker planting. In 2016, they signed a new cooperation deal, with Thanh Hoa pledging to provide 8 million USD to build several infrastructure facilities in the Lao province from 2016-2020.